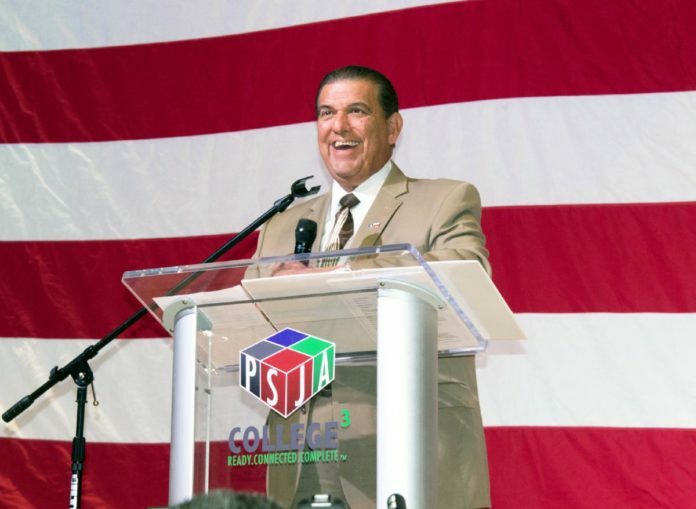 Sen. Eddie Lucio, D-Brownsville, speaks Tuesday during the voter education event sponsored by the PSJA school district. EDINBURG — National Voter Registration Day turned into a massive educational opportunity for the Pharr-San Juan-Alamo school district as more than 800 high school seniors gathered in a sort of pep rally about the electoral process, and the importance of participating in it. The event was part of the annual efforts of two high school social studies teachers, Rey Perez and Marco Villegas, who more than 10 years ago began looking for ways to get students not only learning about the process but excited to become part of it. This year, they invited all seniors to the Edinburg Conference Center at Renaissance, along with parents to hear from local election officials, organization leaders and area state representatives, including state Sens. “Chuy” Hinojosa, D-McAllen, and Eddie Lucio Jr., D- Brownsville; and state Reps. Armando “Mando” Martínez, D- Weslaco, and Sergio Muñoz, D-Mission. The students and parents had the opportunity to explore a ballot on the voting machines on site and learn how the process works. “We wanted the kids to see that their vote transforms into what these gentlemen do when they make laws, and if there are laws that (they think) don’t work and they complain, it is because they didn’t get involved in the process,” Perez said. By learning about the role of each party involved in the process, Perez said he hopes they take their own role more seriously. For Lucio, the invitation was an opportunity to have a non-partisan conversation about the importance of raising a louder voice in the Valley. Low voter turnout in the region is concerning with regional issues requiring representation at the state and federal level. It is important for them to understand how public policy is shaped, Lucio said, from the moment voters go cast their vote and elect representatives, to the moment policy is introduced by the people they chose. “Public policy is established by the representatives that you elect, and if you don’t elect enough people that think like you, you are never going to see the change,” Lucio said. Lucio said he called this speech the Generation of Responsibility, as this generation has the power to shape the future of the Valley and ensure that area issues are not overlooked. It is not enough to say that change is needed, he said, but to get involved in detailing what change means and really work with people who can make that change happen. Valley voters should aim to be the deciding factor in all elections. The next step is to encourage students to not only register but become involved by doing their research on issues of their interest and going out to vote this November, Perez said.